The BAPI-Box, BAPI-Box 2 and BAPI-Box 4 enclosures are made especially for HVAC probes and transmitters. The through holes come out in all directions to accommodate probe sensors. The rest of the through holes provide ½” threaded or thin wall conduit connectors for wiring. The hinged door makes wiring easy and the cover is impossible to lose or drop. The BAPI-Box and BAPI-Box 2 are watertight with a rating of NEMA 4 or IP66 and UV-resilient for outside air use. The BAPI-Box 4 carries an IP44 rating for indoor use. 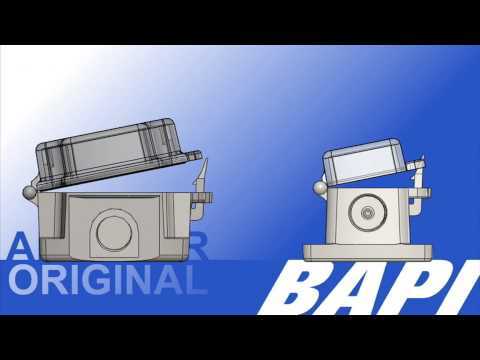 Be the first to review “BAPI-Box, BAPI-Box 2 & BAPI-Box 4 – Polycarbonate Plastic Enclosures” Click here to cancel reply. Find out how the BAPI-Box and BAPI-Box 2 can save you time and money and every HVAC installation. They offer unprecedented ease of installation and eliminate the hassle of locknuts and plugs. They also remain watertight even after multiple openings of the gasketed cover.